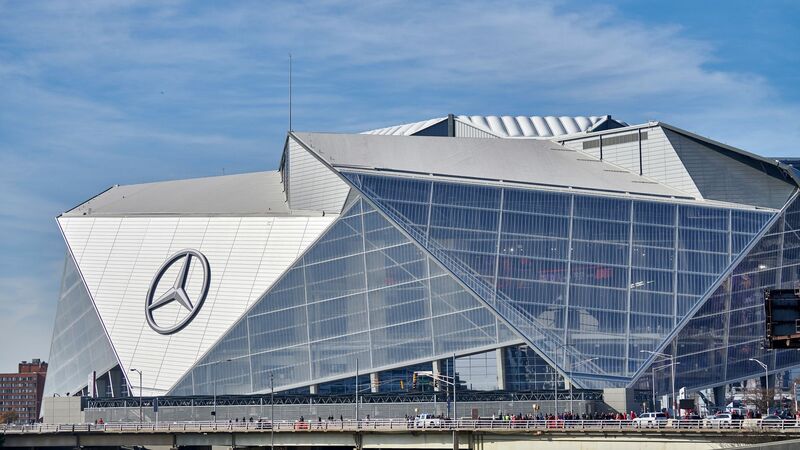 This year’s Super Bowl will be held in the most environmentally acclaimed sports stadium in the U.S., the Mercedes-Benz Stadium in Atlanta. The 2-million-square-foot arena, designed by HOK, opened to the public in August 2017 and was the first professional sports stadium in the U.S. to achieve Platinum LEED certification, the highest rating from the U.S. Green Building Council. Why it matters: A typical NFL game may produce up to 35 tons of waste, or roughly 1.5 pounds per guest. Showcasing sustainability efforts at these highly watched and attended events will help educate fans, reduce operating costs for owners and ultimately lessen the environmental impact for surrounding neighborhoods. 4,000 onsite solar panels can generate 1.6 million kilowatt-hours, enough to power 10 Atlanta Falcons games or 13 Atlanta United soccer matches. It's the first professional sports stadium in the U.S. to earn all LEED's water category credits, owing to the installation of an advanced storm water management system that can store over 2 million gallons of water, which helps reduce flooding risk to surrounding areas. The big picture: The NFL has a long history of promoting sustainability across its organization to lessen the environmental impact of its events, starting with a pilot recycling program that debuted during the 1994 Super Bowl. 2017 Draft Day in Philadelphia featured many sustainability initiatives, including solid-waste and food recovery programs. New and old arenas are encouraged to adopt sustainable practices that demonstrate to fans both the environmental and economic benefits of sustainability. Yes, but: There is still progress to be made with other stadiums during normal seasons. While 6 NFL stadiums currently have LEED certification, and others have clear plans in place, 6 operate absent any announced initiatives. What to watch: Expect more stadiums to follow, as the NFL recently announced a membership with the Green Sports Alliance, an organization aimed at encouraging green and renewable practices at sporting events.